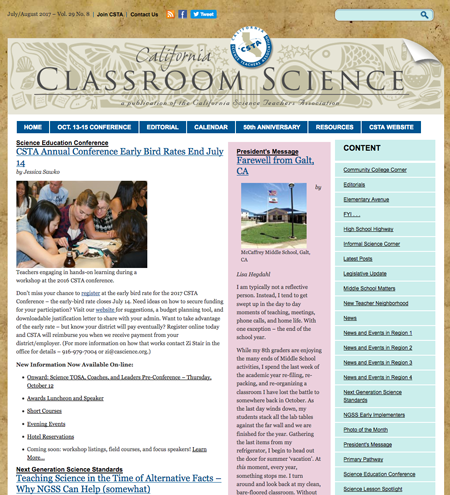 California Classroom Science (CCS), CSTA's signature publication, is an electronic publication that is produced bimonthly. The publication consists of mostly original content produced by CSTA members and provides information of interest to California science educators. CCS is packed with information, news, resources, ideas, and activities of current interest to science educators. CCS is delivered to CSTA members electronically via e-mail and is available on our website for all to enjoy. For information on advertising rates for California Classroom Science call (916) 979-7004 or download the rate sheet. CSTA welcomes contributions, suggestions, and stories from its members. We welcome comments on items published and on science issues in general. All submissions must be submitted electronically. Attach a Word document to an email and send to CCS(at)cascience.org. CSTA reserves the right to edit all materials submitted for length and content. Embed links to referenced web pages. For additional information contact a member of our Publications Committee at CCS(at)cascience.org. For subscriptions or membership information, go to our Membership page, email us , or call CSTA at (916) 979-7004, or fax (916) 979-7023, or subscribe on-line .